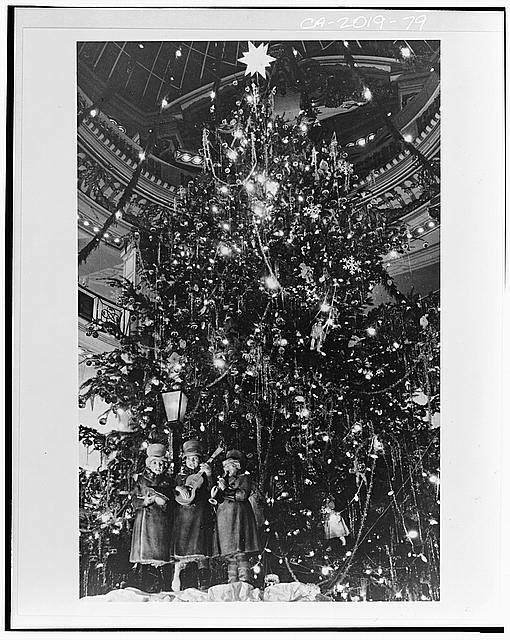 The above photograph is of the Christmas tree in the City of Paris Dry Goods Company rotunda sometime in the mid-20th century. A part of the Library of Congress’s Historic American Buildings Survey/Historic American Engineering Record/Historic Landscape Survey digital collection. From 1850 to 1972, the City of Paris Dry Goods Company was a San Francisco institution until is demolition 1980 after a lengthy, and ultimately failed, attempt to preserve department store. Opened at the beginning of the California Gold Rush, the department store was one of the few buildings to survive the 1906 earthquake and subsequent fire that destroyed much of the city. An opulent rotunda was added following the earthquake, including a stunning stained glass dome. After its reopening in 1909, the story began placing a enormous Christmas tree at the center of the rotunda every holiday season. The tree eventually became the City of San Francisco’s official Christmas Tree, and the center of the city’s holiday festivities. Competition from suburban malls eroded the department store’s revenues following World War II. By the late 1960s, City of Paris Dry Goods Company owner’s decide that that the story was no longer profitable enough to keep open. And so in 1974, the building was sold to the retail giant Neiman-Marcus. Wishing to build its own structure on the site, Neiman-Marcus announced its decision to demolish the City of Paris Dry Goods Company building. A six-year fight ensued, as locals decried the destruction of the iconic building, which they pointed out, was on the California Register of Historic Places. Over 60,000 people signed a petition calling for the preservation of the history landmark. But ultimately, preservationists lost their fight to save the building, and the one hundred and ten year old build was razed. Yet, the historic rotunda and its stain glass dome were preserved as a part of the new Neiman Marcus building, which, despite its initial critics, has itself become a centerpiece of San Francisco’s downtown.